The origins of Yoga are shrouded in pre-history but we do know that yoga was nurtured by the ancient sages at their yoga ashrams deep in the forests of India. Yoga therefore evolved in harmony with nature in an environment rich in trees, wildlife, silence and simplicity. Amboli is one such small village nestling in the Sahayadri hills of western India, abounding in biodiversity and tradition. Located 800 mtrs. 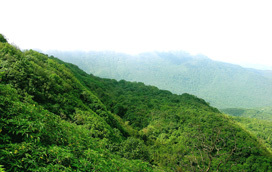 above sea level and commanding a magnificent view of the hills as they descend towards the Arabian Sea, Amboli lies in one the world’s 12 "eco-hotspots"( high biodiversity areas ) with a huge variety of trees, medicinal plants and fauna. Deer, bison, bears and a host of smaller animals coexist in the silent forest with more than 80 species of birds. The local human population is scattered in small village clusters and each of Amboli’s temples has its unique character and history. The combination of jungle cover, low population, traditions and many small but ancient temples makes for an environment close to that of ancient India. To practice yoga in such an environment is to return to the roots of yoga.